Plot: The "black sheep" son of a wealthy family meets a young psychiatric patient who's been raised in isolation her entire life. He then takes the naive young woman home for his brother's wedding. Starring: Evan Rachel Wood, Scott Speedman, Treat Williams, Kate Burton. 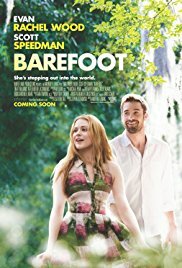 distributed by Roadside Attractions «Barefoot» in the US movie theaters released on February 21, 2014 and has grossed over $15k worldwide; dvd and blu-ray release date was set for April 22, 2014. Netflix dvd by mail rental date set for April 22, 2014. Redbox rental date is not announced. «Barefoot» in the UK released in movie theaters on July 14, 2014. The movie released on dvd and blu-ray on June 30, 2014.